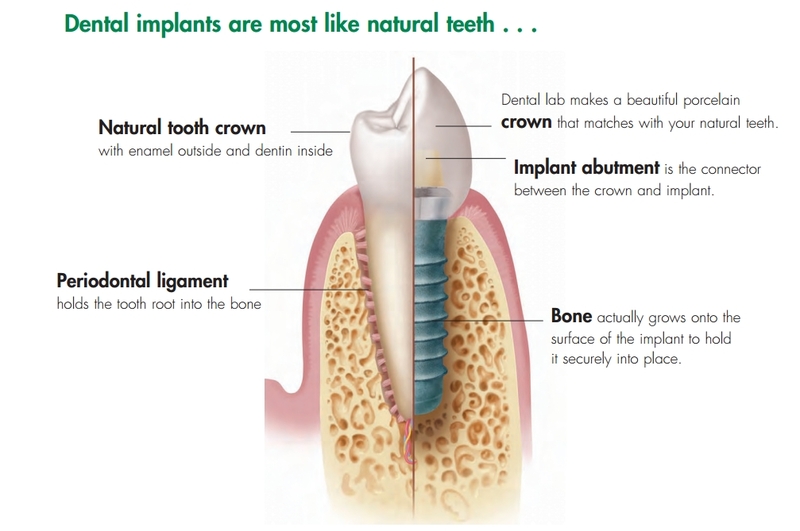 Dental Implants are artificial tooth roots which are used to support one or more false teeth. These titanium screws are placed in the jaw bone and replace the missing teeth and help counter further tooth loss. Once the implant is placed the artificial root takes over the original function and its difficult to differentiate between implant supported tooth and natural tooth. For tooth replacement this is the best permanent and most effective proven technically advanced solution and in many cases the only logical choice of restoration of all functions of teeth and supporting bone structure. Although there are other restorative treatments for missing teeth that we offer, such as dentures and bridges, dental implants provides more comfort, looks and feel much better and can last a lifetime compared to removable bridges and dentures which normally get loose and unstable over time. What happens in the dental implant treatment? Having a dental implant is fairly simple and a pain free process. Patients are booked in for a consultation with the implant dentist at which a full clinical examination is carried out to access patient’s suitability. This will involve taking study models, simple x-rays and a full oral examination. A further 3d ct scan to help measure the bone density and also check where landmark structures such as the id canal are may also be needed. After the assessment the dentist will have a discussion with patients to make them aware of what will happen before, during and after the procedure. This helps the patients to understand and ask any questions they might have about the treatment. Placement – In this stage the area where the implant is to be placed is made numb with local anaesthetic (same as if you have a filling) so that no pain is felt. A small hole is drilled into the jawbone and the implant surgically placed into it. X-Rays will be taken to ensure the implant is placed to the correct depth and angle. 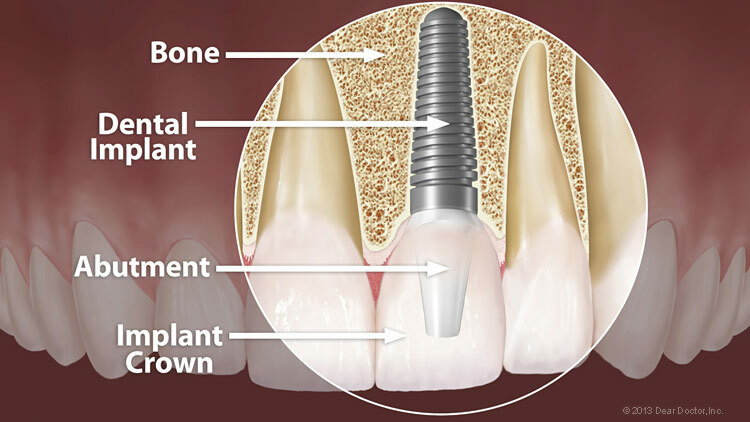 The implant is then covered over with a cover screw and left to heal or a temporary crown is constructed so that it looks like a tooth. Integration – This is the time during which the implant area heals and integrates within the jaw bone. Your dentist will let you know how long depending on the case. Restoration – This is the final part where the permanent artificial tooth is constructed enabling the patient excellent stability and comfort. It can be a crown, bridge or a removable denture which is held firmly by ball-end implants which have been strategically placed in the mouth. This stage will require two appointments or more dependent on the type of construction. Aftercare/Maintenance – Once the treatment is over you will receive the aftercare instructions from your dentist. Maintaining good oral hygiene, eating habits and regular visits to your dentist will help keep the implant healthy and last you for a lifetime. As obvious from the name, these are dentures attached and supported via dental implants. Implant supported dentures or denture implants are used in cases where person lacks teeth in the jaw but has got enough bone to support dental implants. Dental implants are placed in placed in the jaw in order to support or retain partial or full denture. Normally dentures rests on gums but these ones have special attachments so that they can be placed over dental implants. Traditional denture become loose and sit less tightly and firmly over time, whereas denture implants provide more stability, better quality and cost saving in long run. Patient can get implant supported denture in either lower or upper jaw. The cost of implants supported denture depends on costs of both dental implants and dentures. The price of implants depend on type and no. of dental implants required. During your consultation, the dentist can examine your case and recommend how many dental implants would provide best retention and stability for the dentures. For more information book a consultation with our Dental team. What Is Advantage Of Implants Over Other Methods Of Tooth Restoration ? The most common alternatives to dental implants are denture and bridges. Getting a bridge requires attaching false teeth to your existing teeth. This involves filing or modifying the teeth on either side of missing teeth in order to support bridge which can have implication is future. Also, often require replacement which makes it more costly option over time. Dentures are false teeth attached to plastic or metal plate which are placed in placed in mouth and are removable. They are cumbersome, uncomfortable and limit your dietary intake. Also, with time they might wear or become loose fitted causing slippage and imprecise fit issues. Whereas dental implants are the permanent solution to missing teeth. They are comfortable, effective, aesthetically pleasing, look and behave just like natural tooth, do not impact surrounding teeth and less costly over long run. How Do I Know If I’m Suitable For Dental Implant Treatment ? A person who can undergo tooth extractions or bridgework can undergo dental implant treatment. The location and the amount of bone available in the implant area is normally the major factor to be considered for any case. Normally implants are suitable and best option for most cases but its best to have a consultation with our dentist to check for suitability and ask any questions you might have for the treatment. How Long Does It Take For The Dental Implant Treatment ? Your dentist should be able to give you a rough estimate about time after your first consultation. Nowadays some false teeth are fitted as the same time as implants for some cases. Check with your dentist to see if it’s suitable for you. 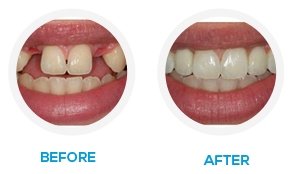 Normally the false teeth are fitted after 3-4 months after placing the implant. In some instances it might take longer due to complexity of the case but your dentist should be able to let you know about this during your treatment. How Do Dental Implants Look ? The cost really depends on patient’s condition and how many implants they need. In most cases the cost of implants is slightly more than the cost of conventional treatments with crowns and bridges, but they prove to be cost effective over time and provide a natural look compared to other options. Also, there are other advantages of implants too. Bridges used to be the only permanent solution to a missing tooth in your mouth. This would involve the dentist needing to cut teeth on either side to fit crowns to support the bridge. With dentures, your eating and drinking might get affected as they move about. Also dentures cover soft tissue such as the palate which makes eating not so enjoyable as there are less tastebuds present. With implants there is no need for cutting teeth like in bridges or worry about movement as in dentures. Is The Implant Treatment Painful? The treatments are normally carried out by making the implant area numb with help of local anaesthetic so that the patients don’t feel any pain. After the treatment you might feel a bit of discomfort just like a normal tooth extraction for a few days ater surgery. Having a simple painkiller such as nurofen will help. Can Teeth Fitted To Implants Be Taken Out? So how long do the natural teeth last? They are meant to last lifelong but we all know the cases where teeth haven’t served persons lifetime due to improper care or lack of treatment when required. It’s the same with Implants, with proper care and routine dental checkup they should also last lifelong. The success is dependent on maintenance and care you take after your teeth. Do I Need To Be Careful On What I Eat Or Drink After Getting Dental Implants ? One of the key benefits of implants is that it behaves just like natural tooth, meaning there is no restrictions on food or drinks. Do Dental Implants Require Special Care ? Dental Implants care isn’t much different to care required for your natural teeth. You require to maintain normal oral hygiene i.e brush and floss your teeth regularly and visit your dentist occasionally for a checkup and clean.